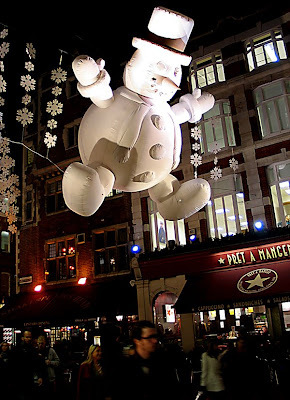 These poor saps tooling down London's Carnaby street don't realise they're about to be flattened by a giant snowman! Judging by its trajectory at least a couple of dozen shoppers are in for the Christmas surprise of their life. It must be the result of recent global warming as flying snowmen in this area aren't usually this large. This beautiful Dali style window is on the east side of 'St martin in the field church' central London. 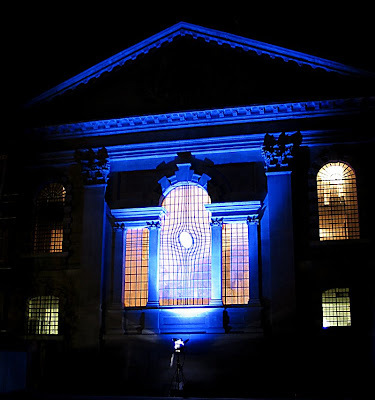 It was designed by artist Shirazeh Houshiary and architect Pip Horne, to replace the window installed following World War II bomb damage. At present it looks like it is temporarily lit by a stand alone builders lamp, which will be a shame as it wont look so stunning at night when unlit. I hope they plan something more permanent. If it go's to a committee, then there's not a chance in hell as some whacked out human rights group will claim cruelty to glass or some such other ludicrous suggestion. It puts me in mind of a matrix leading to another time or dimension. Imagine having to glaze the mother...! 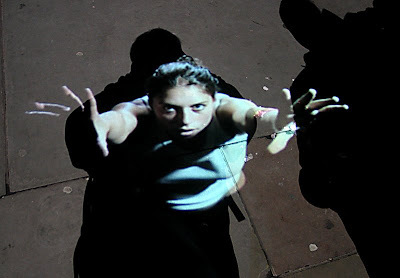 Artist Rafael Lozano-Hemmer is the dude responsible for this funky installation on Trafalgar square's north terrace, where animated videos appear in the shadows of people walking throughout the area. 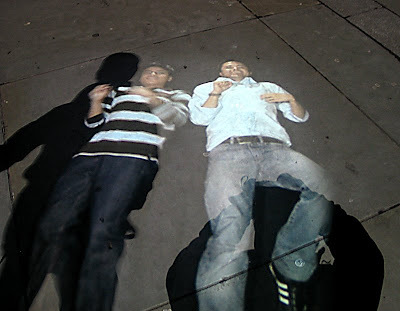 Two large projectors help pedestrians cast long shadows. Sensors are then used to track your movements and project moving portraits into them, and you know what? It works!! The portraits cast inside the shadows will look at and interact with the pedestrians before appearing to lose interest as the person walks away. I thought it was pretty neat. 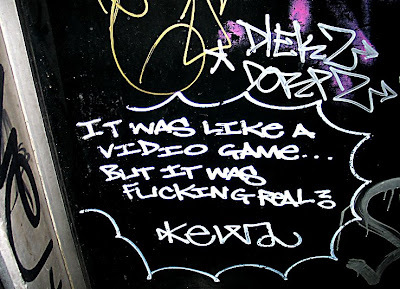 I happened across this piece of graffiti on a shop window the other day and it got me thinking. It sort of sums up the pace of life here sometimes (London that is). Everyone rushing about like headless chickens, faces like bulldogs chewing wasps! Its so depressing even Mother Theresa would need Valium to cope. It makes me even more determined to keep traveling, seeking out new places to visit, new people to meet, getting to know them, swapping emails, then finding a small scrap of paper in your wallet four weeks later only to wonder who the hell it was from?